With its large, pink or white crinkly petaled flowers, mallow resembles the tropical hibiscus, but this plant grows in temperate areas. This annual is native to Europe but has widely naturalized in the Southern United States. Once established, mallow grows back from seed each year. 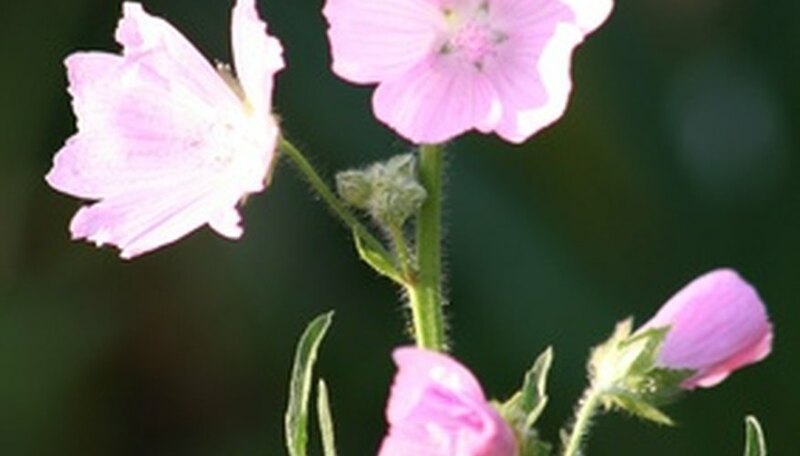 Gardeners can plant many types of mallow, including red globe mallow, Oregon checker-mallow, common mallow and--the most well known--rose mallow. Mallow flowers throughout the summer and can grow quite tall and spread widely once established. Locate a full to partially sunny spot for your mallow plants that allows them room to grow once the air temperatures are warm and the soil has warmed to 70 degrees F. They are not particular about the type of soil, but mallow does spread once established and the seeds do not germinate in cold soil. Turn over the soil with a shovel to aerate it and break apart any soil clumps. Remove rocks, sticks and weeds from your garden bed. Rake the soil back into an even layer before planting mallow. Dig a shallow furrow 1/8 inch deep using a trowel. Scatter mallow seeds in this furrow, spacing them 1 to 2 inches apart. Cover over the furrow with soil to finish planting mallow. Water the garden bed until the soil becomes moist but not soggy. Keep the soil moist until the mallow seeds germinate and begin to grow in 15 to 30 days.